Home Office treatment of long term UK residents “appalling”…so put it right NOW, Amber Rudd. 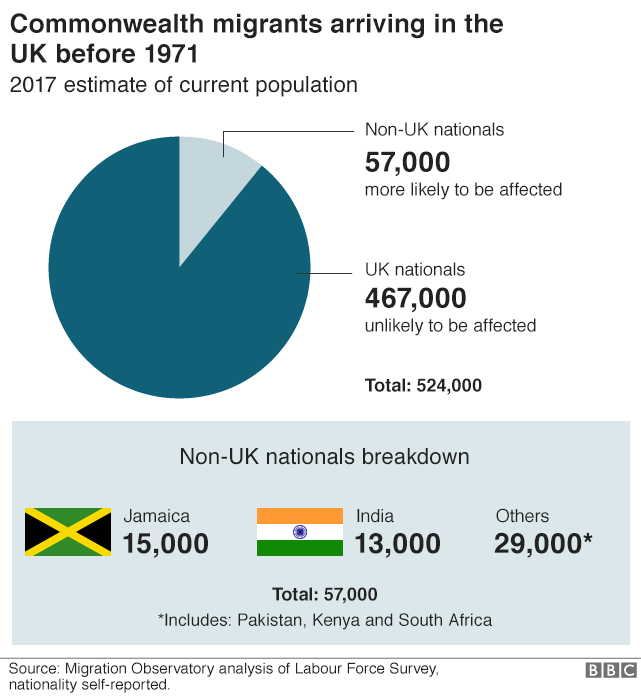 Recent changes to immigration law in the UK, which requires people to have documentation to work, rent a property or access benefits, has highlighted a serious issue affecting long-term residents from the Commonwealth and has left many people fearful about their status to live in the UK and the right of access to, e.g, NHS care.Many long term British residents are being subjected to appalling treatment and distress. A large number of commonwealth citizens are having to contend with a lack of help and support . This diagram shows how many people could be affected….nobody knows!! Many long term British residents are being subjected to appalling treatment and distress. This problem has been going on for years. It is a systemic problem at the Home Office which needs to have a fundamental change in its approach to one of offering assistance to those affected and move way from detention and removal of people who have every right to stay here. A caring and well judged approach by the Home Office is needed. The immigration system should be about individuals and the default position should not be one of overly complex and bureaucratic requirements to be met. The Home Secretary is urged to review the situation urgently and take the necessary action to assist all those who are facing appalling treatment. The Home Secretary has announced yesterday a new task force to help those affected, and promised to waive fees for new documents needed to prove their status to stay in the UK. The announcement is welcome but her commitment needs to be firm and it needs to be demonstrated in practice. We’re going to be watching! !